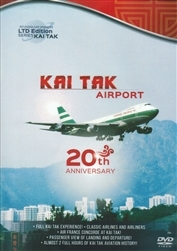 Kai Tak Airport Hong Kong 20th Anniversary DVD. KAI TAK ... the two words symbolizing the absolute pinnacle of commercial aviation history. The opportunity to experience the live spectacle of Kai Tak ended forever in 1998 when the runway lights were extinguished and the airport was relegated to the history books forever. 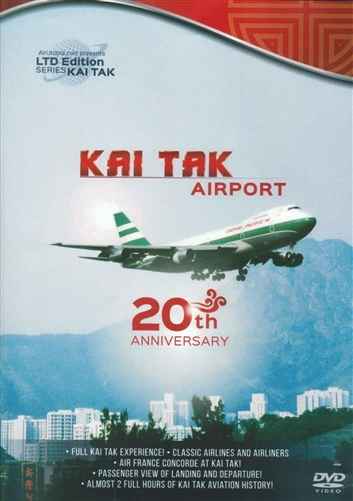 Kai Tak Airport was located in the midst of heavily-urbanized Hong Kong. It was a destination for aviation buffs due to the fact that you could see the airliners very closeup. This DVD captures that experience from a bygone era. See classic airliners, the Concorde and much more in this two hour DVD. All the remains of Kai Tak Airport 20 years later are vivid memories, thrilling anecdotes and this amazing collection of living video aviation history! Prepare to be transported back to a bygone era of commercial aviation as we resurrect the complete Kai Tak experience from one of the world's largest historic aviation video archives. Air France Concorde at Kai Tak! Passenger View of Landing and Departure!